Jason Parker has shipped more than 100 wheelchairs to animals in need across the country — all for free, through his nonprofit, Gunnar’s Wheels Foundation. Each one has been given to a dog — or sometimes a cat, or goat — who needed the chair to walk. Often, the chairs have gone to shelter and rescue pets who might have otherwise been euthanized. The inspiration for this generosity is Parker’s own dog Gunnar. Gunnar was hit by a truck in 2014, not far from their home in Osseo, Wisconsin. He had two broken vertebrae and 50-50 odds of recovering mobility. Parker estimates he and his wife Stephanie spent about $7,000 on surgeries, hydrotherapy and more, but Gunnar’s hind legs still didn’t work. 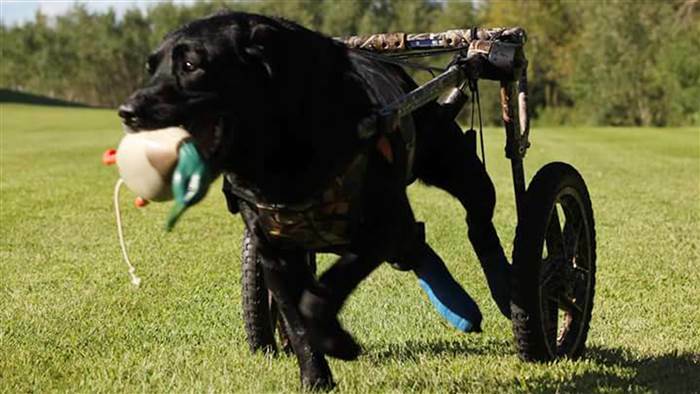 In the end, Parker was “tapped out” and didn’t have another $600 to buy his dog the wheelchair he would need to walk again. Luckily, Parker’s friends came to the rescue — they pitched in to pay for the equipment. “I said to my wife, one of these days we’re going to pay it forward,” Parker said. Parker, a volunteer firefighter and a car-parts salesperson, finally got that chance last summer, when he learned about a shelter dog named Hope, who had been found under a house in Houston after getting struck by a car. While veterinarians at a shelter were able to save her, her back legs didn’t work. She needed a wheelchair. Parker came across a Facebook post about Hope and thought, “Let me see what I can do,” he said. Parker found an appropriately-sized used wheelchair on Craigslist. He bought it and shipped it to Houston, where it changed Hope’s life. Hope was in rehab for six months, getting stronger and stronger until she didn’t even need the chair anymore. Then the chair was sent to another dog in need, and Hope was adopted. Radar is another dog who received a wheelchair from Gunnar’s Wheels. The mission has grown from there. By the end of this week, Parker expects he will have shipped his 129th wheelchair. The chairs go to pets across the country, who keep them until they die or until they no longer need them, and then they’re returned so they can be sent to another animal. Parker is eager to continue expanding Gunnar’s Wheels Foundation. Gunnar was the ring bearer at Parker and his wife’s wedding last June. He started a GoFundMe campaign to raise money so that he can provide chairs for even more animals who otherwise wouldn’t be able to have them, and the fundraising site recently named him a GoFundMe Hero. “The relief I hear in someone’s voice when I tell them I can help — it’s a good feeling,” Parker said. Parker pays for the chairs mostly with donations — the GoFundMe account has raised nearly $70,000 — and purchases them from three different companies that manufacture canine wheelchairs. Gunnar himself is also doing great — as goofy, happy and loving as ever. It’s been three years since his accident and Gunnar, now 10 years old, is nimble enough in his wheels that he and Parker can even go hunting together. “Still a paraplegic. But yes, healthy as a horse,” Parker said. Parker’s favorite time of the night is when he and Gunnar can sit and hang out together. Parker is well aware that his community’s generosity is why he still has Gunnar, and so he’s committed to making sure no other animals in need of wheelchairs go without. Every day, he and his dog sit on the floor together, Gunner supervising as Parker packs up chairs and sends them to other pets.